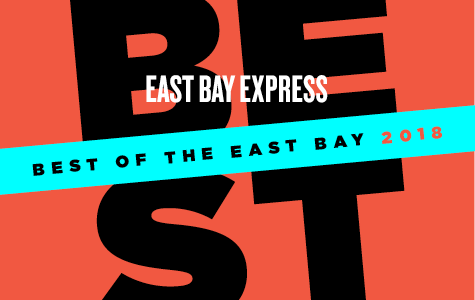 Best Mural on the Island – "Born to be loved"
Best Cannabidiol Coffee – Bicycle Coffee Co.
Best Delivery Service – C.R.A.F.T. Best Decolonized Food Company – Diaspora Co.
Best Graphic Novelist Fighting for the Underdog: Thi Bui – After publishing her hit debut, ‘The Best We Could Do,’ the Vietnamese-American writer, illustrator, and educator is looking to use her platform to help other refugees. Best Artist with Something to Say: Lukaza Branfman-Verissimo – The Oakland artist and activist works to prioritize fellow queer people of color. Best Harbinger of Long Lines: Edward Wooley – Hundreds line up weekly for Chef Smelly's creole pop-up. Best Animal Rescuer: Alex Sanchez – The dog program manager at Hopalong Animal Rescue helps find homes for lost pets amid a raging fire season. Best Do-Gooder Business Owner: Menbere "Menbe" Aklilu – On her Richmond restaurant Salute e Vita's last day, she gave away every meal for free and asked diners to donate money to their servers. But that's not all. Best Acupuncturist and Chinese Herbalist – Xiaojing Wang possesses deep knowledge and an empathetic, intuitive touch. Best Follow Through: Brahm Ahmadi – The People's Grocery co-founder has worked tirelessly to bring a grocery store to West Oakland — and it's finally happening. Best Child Prodigy: Francis Lau – At age 12, Lau has already shared a stage with Devo. Best Journalist-Turned-Historian – Liam O'Donoghue's podcast is one of the best, most accessible platforms for learning about Oakland's history. Best Citizen Keeping Police Accountable: Gerald Smith – The longtime Oakland activist has been active with Copwatch, the Oscar Grant Committee, and Occupy Oakland. Best Youth-Led Nonprofit: RYSE Youth Center – RYSE aims to build the next generation of people of color to lead Richmond. Best Town Representative in Hollywood – We're all proud to have Boots Riley repping the Town in Hollywood.